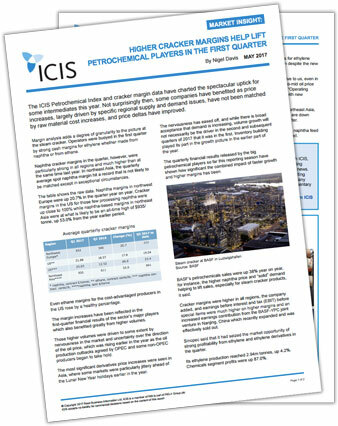 The ICIS Petrochemical Index and cracker margin data have charted the spectacular uptick for some intermediates this year. Rising prices, largely driven by specific regional supply and demand issues, have not been matched by raw material cost increases, and price deltas have improved. ICIS Insights editor Nigel Davis analyses European margins against competitors in other regions, and who the big winners are from the current price trends.